What is a "Minimum Fundable Company?" A Minimum Fundable Company (MFC), typically a startup, is a company that has achieved enough business traction and momentum to attract serious interest from investors. Why should I take the MFC Test? Pinpoint the Areas You Need to Work On. 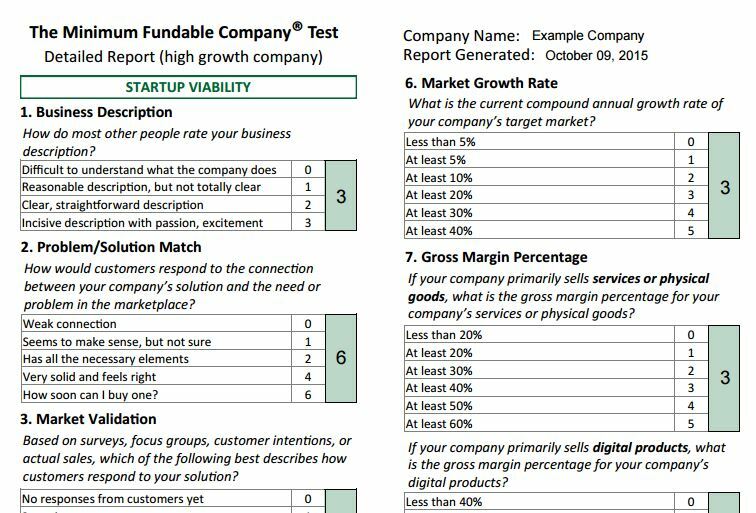 The test results will help you see the specific areas where you need to improve your fundability. Develop an Effective Action Plan. You'll learn how to get your startup deal in front of investors sooner – which means you can GET FUNDED SOONER. Track Your Progress. Save your MFC Scores over time and share them with colleagues, advisors, mentors, and investors. In addition, the instructive videos that accompany each question will help you understand what investors are looking for in a startup company. How do I take the MFC Test? Register. Simply provide your first name and email address in the fields at www.mfctest.com, and once you respond to our verification email, you can immediately start the test. Investors get paid back upon a liquidity event, when they can cash in their stock. Investors get paid back at regular distributions, such as quarterly dividends. Answer the 20 Multiple-Choice Questions. Answer the questions in any order. If you are not sure of your answer, select "Not Sure" for that question. Make a selection for all 20 questions. Go back and change your selections at any time. Your MFC Test Results are displayed in both summary and detailed form. What do the 20 questions cover? Business Description – how convincing and exciting is your elevator pitch? Problem/Solution – how well does your solution match up with a real problem? Market Validation – what feedback have you gotten from the marketplace? Business Stage – how far along is your business toward getting paying customers? Market Size – how big is the market you are going after? Market Growth Rate – how fast is that market growing? Gross Margin – what is your gross margin on your product sales? Recurring Revenue – what type of recurring revenue streams (if any) do you have? Marketing Efficiency – how efficient is your marketing? Partnerships – how are you leveraging other businesses to make sales? Competitive Advantages – what advantages do you have over your competition? Intellectual Property – what patents, trademarks, or trade secrets do you have? CEO/Founder Experience - what type of startup experience does the founder have? Management Team - how experienced is the management team? Board of Advisors - do you have a board of advisors? Financial Projections - how fast will you grow your revenue or profits? Investor Split - what percentage of the company will investors own? Milestones - how feasible will it be for you to achieve your milestones? ROI Potential - what is the expected return on investment? Time to Exit - when do you expect your company to have an exit? Rate of Return - how much do investors make on their investment? First Returns - how soon do investors start receiving returns? Duration of Returns - how long do investors continue receiving returns? Sale of Ownership Interests - can investors sell any of their ownership interests? Security of Capital - are there assets that could be liquidated to pay back investors in the event of business failure? The scoring scheme and weighting of scores is based on 15 years of experience in helping entrepreneurs raise funding from investors. The top score in each of the five factors is 20 points. It is recommended that you achieve a score of at least 10 points in each of the five factors in order qualify as a Minimum Fundable Company. Does a high MFC Score mean that my startup will get funded? No. There are many factors that influence investor decisions, and fundability – as measured by the MFC Test – is only one of them. Select My Account on the drop down menu in the upper right corner. Select “Delete My Account” and then confirm the deletion. If you delete your account, all your Companies and Test Results will be deleted and there is no provision to restore this data once you delete your account.